Bigger than Avril Lavigne! More exciting than National Hockey Night! Scott Lobdell returns to the X-Men Universe and heads north of the border for the surprising premiere of an ALL-NEW, ALL-DIFFERENT ALPHA FLIGHT! The Canadian superteam returns in a shocking new series that will be the talk of Saskatchewan! Featuring the debut of new heroes and the return of several old favorites!<br />Walter Langkowski, a.k.a. 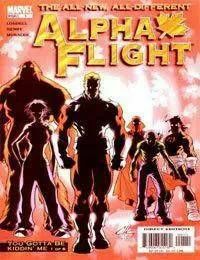 the spectacular Sasquatch (the hairy one), attempts to recruit an All-new, All-different Alpha Flight. He makes offers to all types of heroes: Major Mapleleaf (the blonde guy), Centennial (the old guy), Nemesis (the woman in the mask, with the sword), Puck (the punky bartender), and Yukon Jack (the guy without a shirt). After Laying out his case, saving a world that hates and fears them, they all, not surprisingly, give him a big, fat no.